Agrasain Aagman is one of the prime properties scheduled to come-up in Faridabad by the middle of the year 2019. It is being launched by Agrasain Group, which is already a remarkable property builder having made a mark of its own within a short span of time. 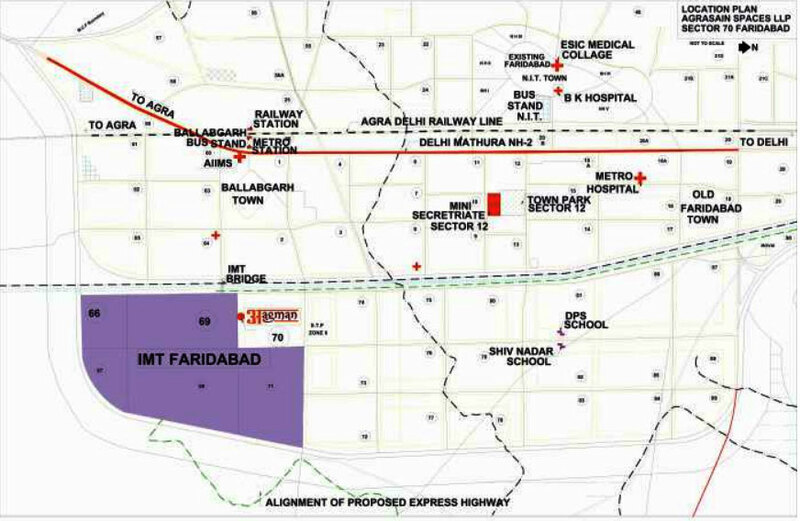 It has proposed this affordable housing project opposite the Industrial Model Town (IMT), Faridabad at Sector 70. The services of the firm has been put with the best efforts in building comfortable projects, and the nearness to the Delhi Border promises to make this residency one of the most sought after property in Faridabad. The firm is committed to bring out the best in terms of the initiative taken by the government towards the national goal of “Housing For All by 2022”. The builder is reputed and has been a known name in the industry because of some well-known projects such as Omaxe World Street, Crown Plaza, and many others. The prominent feature of the project is that it is spread in an area of 10.63 acres. The property is prime for several reasons like excellent floor plan along with gated and walled residential complex with convenient shopping area along with no parking charges. The easy accessibility to schools, college, bus stand and entertainment hubs make it one of the properties which is in huge demand. The community centre inside the residency will help for social gatherings, and street lights will be of LED which will lead to less power consumption. There are many green belts around the area which makes it one of the most demanding properties. Agrasain Aagman Faridabad is an attractive investment options which is pitched as a property which will demand huge returns in terms of investment. It is ideal for first time investors and when one goes for looking out the best property then nothing can beat the property as the nearest metro station is Ballabhgarh. There are many industrial sectors in the nearby areas which makes a great location for small scale industrialists. Ballabhgarh is one of the emerging destinations in terms of growth and there are many mixed-use land developments which makes it commercially viable. The professional and passionate industrialist will certainly look for a project near the industrial sector. The Agrasain Aagman price is affordable as mentioned above and is ideal for residents who are looking for a location on the outskirt of the city. Experience the wind of change at Agrasain Aagman!